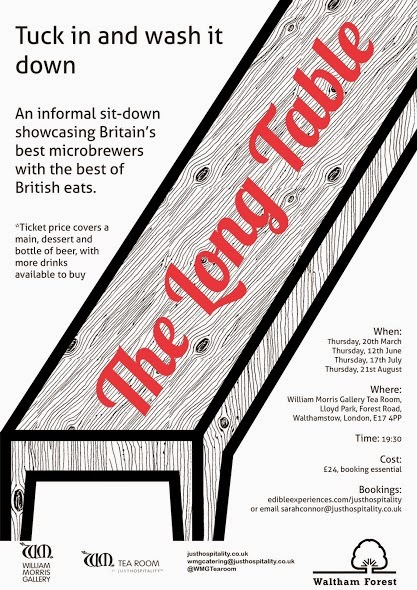 The Long Table is back with a new series dinners at The William Morris Gallery in Walthamstow, featuring delicious food for sharing, and a different craft brewer each month. So far dates for June, July and August have been announced. "Following on from the success of the first set of Long Table dining events we've decided to add four more dates! The Tea Room is taking advantage of the William Morris Gallery's gorgeous, glass-roofed orangery extension to serve up some two course delights re-starting this Spring. These will celebrate Morris' ethos of sharing, beauty and community, as well as his passion for artisanal techniques. Sit at the Long Table each month as chef Chris Pickett serves up meticulously prepared treats using the best of modern techniques and where taste is king. We'll also showcase a different microbrewer each month so you can wash down all that lovely food in style."